We camped below the Fire Lookout on Kendrick Peak just north of the old Ranger Cabin. Denny (Tortoise Hiker) and Bob (RLJamy) are setting up their tents. I don't know what gear they have. This was a group from HAZ - HikeArizona.com. I backpacked the Pumpkin Trail - Bull Basin Trail loop up to the Kendrick Mountain Summit and camped northeast of the old Ranger Cabin. <a href="http://hikearizona.com/x.php?I=4&amp;ZTN=195&amp;UID=21152" rel="nofollow">hikearizona.com/x.php?I=4&amp;ZTN=195&amp;UID=21152</a> From the USFS <a href="http://www.fs.fed.us/r3/coconino/recreation/peaks/kentrick-mtn-wild.shtml" rel="nofollow">www.fs.fed.us/r3/coconino/recreation/peaks/kentrick-mtn-w...</a> Kendrick Mountain WildernessKendrick Mountain Wilderness encompasses Kendrick Peak, one of the many peaks of the vast San Francisco mountain volcanic field located on the Coconino Plateau in north-central Arizona. Reaching an elevation of 10,418, the summit affords excellent views of the surrounding plateau, including the San Francisco Peaks to the east, the distant red rock of the Oak Creek/Sycamore Canyon country and Sitgreaves and Bill Williams Mountains to the south, Red Butte and distant views of the north rim of the Grand Canyon to the north. A fire lookout was first established on the summit in the early 1900's, and continues to be staffed to this day. In 2000 a majority of the wilderness was involved in a large wildfire. Dramatic vegetation patterns were created by burn intensities ranging from light to very severe, most evident on the west, north, and east slopes. On-going natural recovery processes may be observed, with early seral species becoming established in the severely burned areas. Characteristic montane coniferous forests, aspen stands, and high mountain meadow grasslands will re-establish with time. Unstable volcanic soils have undergone recurring severe erosion on the steeper slopes within burned areas, causing damage to the trails and access roads. Soils in the burn area will take many more years to re-stabilize. Three maintained trails totaling 14 miles offer access to the wilderness. The Kendrick Mountain Trail, Pumpkin Trail, and Bull Basin Trail all lead hikers to the top of Kendrick Mountain and to the fire lookout tower. When the lookout tower is open during summer months, the lookout operator usually welcomes visitors to visit the top of the tower to enjoy the views. There are no reliable water sources on the mountain, so pack in plenty. All of the trails are considered to be challenging due to the lack of water, impressive elevation gains, and the effects of the wildfire, including numerous fallen/falling snags and recurring trail erosion damage which can make route-finding difficult. We all know spending time outdoors does the mind and body good. So it's time to set up camp and sleep outdoors! Whether you're headed to a national park or just planning to pitch a tent in a nearby park, there are plenty of supplies to choose from. In the slideshow below, we look at 35 camping supplies from cookware to sleeping bags and everything in between. 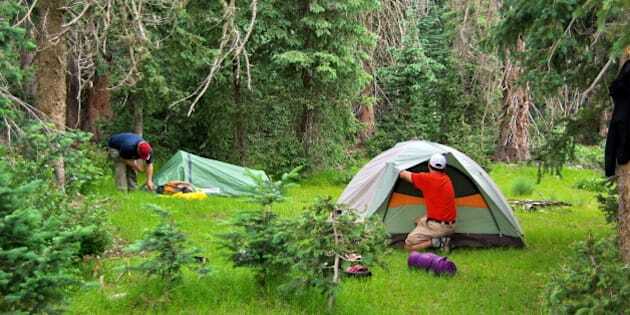 But if you aren't ready to make the investment, it's also helpful to know many campsites and stores like MEC offer equipment rentals, so you can always test out the products before you decide to buy. What are your must-have camping items? Let us know in the comments below.